The Master of Claude de France was one of the last great French illuminators. His was a fine and delicate style characterized by the use of subtle lilacs, mauves, and roses juxtaposed with chartreuse and royal blue—all applied in tiny, almost invisible brushstrokes. The Claude Master flourished in Tours (in the Loire valley) for only about twelve years (ca. 1508–1520), leaving behind a small but exceptional oeuvre. Over the last several years, the Morgan has acquired a critical mass of the Claude Master's work, of which nearly two dozen items are featured in this exhibition. The centerpiece is the Prayer Book of Claude de France, one of two tiny, jewel-like manuscripts that he painted for the queen of France and after which the artist was named. The Prayer Book was a personal commission by Queen Claude (first wife of King François I) around the time of her coronation in 1517. The manuscript measures a mere 2 ¾ by 2 inches, but it includes an amazing 132 miniatures. 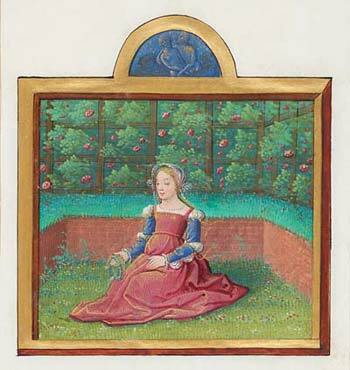 Encoded within the tiny book are images that reflect the queen's private anxieties, including her fear that she might have inherited from her mother, Anne de Bretagne (twice queen of France), the inability to bear healthy sons. Visitors have the opportunity to access all of the miniatures in the Prayer Book via an iPad in the gallery. Also on view are twelve newly discovered calendar miniatures by the Claude Master recently acquired by the Morgan. These works are complemented by loans from private collectors and from the Free Library of Philadelphia. For the first time in 500 years—Claude's Prayer Book is reunited with her Book of Hours, loaned to the show by Herbert Tenschert. Manuscripts by Jean Bourdichon, the Master of Claude’s teacher, and by Jean Poyer and Jacques Ravaud, two artists active in Tours who influenced the Claude master, are also displayed. This exhibition is made possible by Frances Beatty and Allen Adler, Caroline Sharfman Bacon, and an anonymous donor with assistance from the Visiting Committee to the Department of Medieval and Renaissance Manuscripts. The accompanying publication is underwritten by the Andrew W. Mellon Research and Publications Fund.